OpenDaylight’s NetIDE project allows users to run SDN applications written for different SDN controllers, e.g., Floodlight or Ryu, on top of OpenDaylight managed infrastructure. The NetIDE Network Engine integrates a client controller layer that executes the modules that compose a Network Application and interfaces with a server SDN controller layer that drives the underlying infrastructure. In addition, it provides a uniform interface to common tools that are intended to allow the inspection/debug of the control channel and the management of the network resources. The Network Engine provides a compatibility layer capable of translating calls of the network applications running on top of the client controllers, into calls for the server controller framework. The communication between the client and the server layers is achieved through the NetIDE intermediate protocol, which is an application-layer protocol on top of TCP that transmits the network control/management messages from the client to the server controller and vice-versa. Between client and server controller sits the Core Layer which also speaks the intermediate protocol. 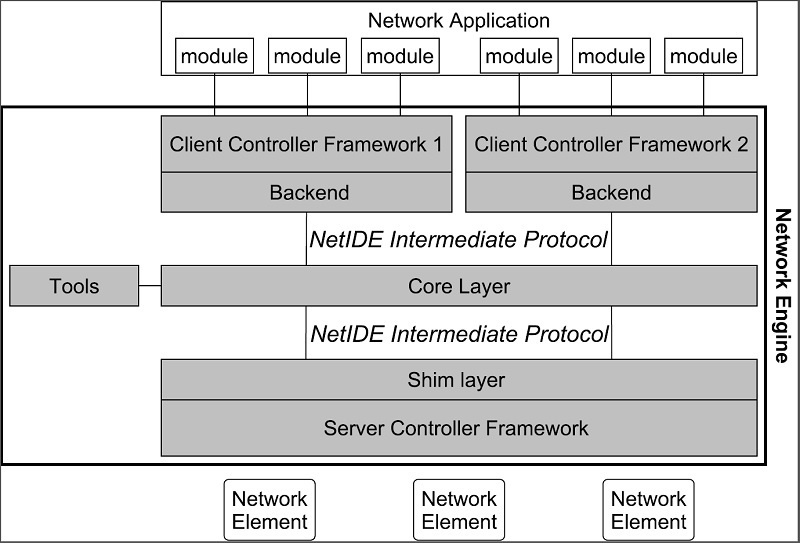 The NetIDE engine follows the ONF’s proposed Client/Server SDN Application architecture. When an application module sends a request to the network (e.g. flow statistics, features, etc. ), the Network Engine must be able to correctly drive the corresponding reply to such a module. This is not a trivial task, as many modules may compose the network application running on top of the Network Engine, and there is no way for the Core to pair replies and requests. The transaction IDs (xid) in the OpenFlow header are unusable in this case, as it may happen that different modules use the same values. 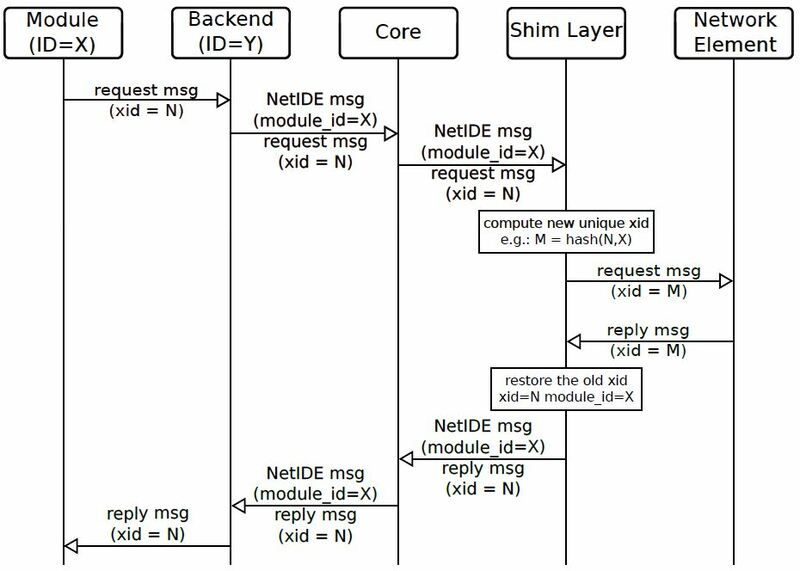 In the proposed approach, represented in the figure below, the task of pairing replies with requests is performed by the Shim Layer which replaces the original xid of the OpenFlow requests coming from the core with new unique xid values. The Shim also saves the original OpenFlow xid value and the module id it finds in the NetIDE header. As the network elements must use the same xid values in the replies, the Shim layer can easily pair a reply with the correct request as it is using unique xid values. The below figure shows how the Network Engine should handle the controller-to-switch OpenFlow messages. The diagram shows the case of a request message sent by an application module to a network element where the Backend inserts the module id of the module in the NetIDE header (X in the Figure). For other messages generated by the client controller platform (e.g. echo requests) or by the Backend, the module id of the Backend is used (Y in the Figure). Below are the configuration items which can be edited, including their default values.